This Chinese porcelain plate, probably from the late 19th century, is decorated in the famille rose colour palette, popular on Chinese ceramics during that period. The central image is a Chinese rural scene: a woman accompanied by a yellow deer is presented with a box. The plate was part of the collection of Charles and Ella Elgar who lived at Fernside estate near Featherston, Wairarapa, from the 1880s. 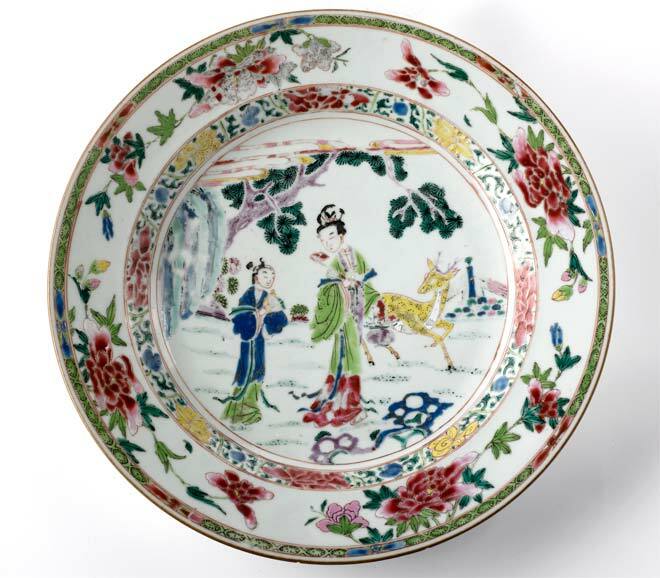 Ceramics were among a wide range of Asian products imported into colonial New Zealand. Tea was perhaps the most significant, but rum, textiles, furnishings, sugar, rice, ivory, tobacco and fireworks were also brought in.